Fluoroscopy Radiation Risk | IKOMED Technologies Inc.
Fluoroscopy is a medical imaging technology that is widely used to create real-time movies of internal body structures through X-ray radiation. Fluoroscopy is utilized to guide minimally invasive surgical interventions where catheters, or tools, are inserted percutaneously in order to diagnose and treat internal organs. Minimally invasive surgery is a growing field in medicine. 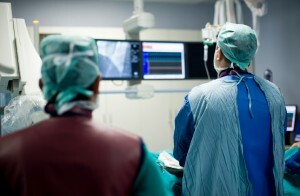 Procedures such as coronary angiography, angioplasty and stent placement rely heavily on the use of fluoroscopy to visually guide the surgeon performing the procedure. Every year, over 5 million fluoroscopic procedures are performed in the U.S. alone1. This number is only growing as minimally invasive surgery technology improves. These minimally invasive interventions provide a better, safer and cheaper solution when compared to open surgery. However, using fluoroscopy in these procedures has the potential for long-term health hazards resulting from ionizing radiation exposure to both patients and medical staff. As minimally invasive surgical technologies advance, more complex procedures are being conducted resulting in longer fluoroscopy times and higher X-ray doses to patients and medical staff. Radiation-induced heath risks in patients undergoing fluoroscopy, such as skin burns, have been recognized for many years. Furthermore, medical staff performing fluoroscopy have been prone to back-related injuries from prolonged use of heavy lead aprons to protect themselves from radiation exposure. Recent research of fluoroscopy procedures has also demonstrated an increased risk of radiation-induced cataracts for medical staff2 and cancer in patients3, promoting discussion on occupational hazards and better regulatory mandates in fluoroscopic procedures. IKOMED Technologies Inc. provides patients and medical staff with a safer environment in which to conduct fluoroscopic procedures.